Meditation is not difficult to learn. Sometimes that’s the big challenge with meditation. We have grown to expect that something THAT valuable, that beneficial, that timeless and ancient .. should be easier. sparklier. more complex. But the big secret people is that meditation is a practice and you have to DO IT. And for most of us, when we first try meditation there is anything BUT stillness and peacefulness within .. we close our eyes and instead of silence we find ourselves overtaken by a stream of chaotic and badly behaved thoughts. However, with practice we begin to notice small ‘gaps’ between our thoughts .. and behind the thoughts a background of stillness and clarity. 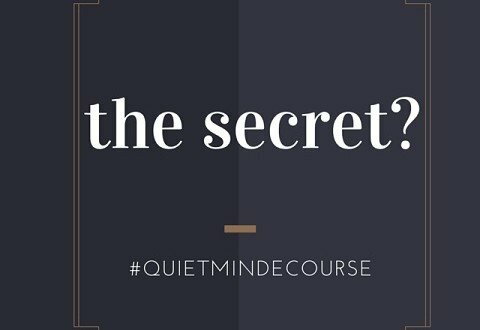 We created the Quiet Mind Meditation E-Course to gently steer, encourage, motivate, nourish and guide you into your own regular meditation practice. We provide a daily email with all that you need. A packed lunch of luscious instructions, links to other resources like guided meditations and online articles. We also have a private blog with a library of information and a place to share insights and respond to questions ..
We start with simple and practical Meditative Exercises and gentle build our sitting practice from there. In the beginning it is more about setting aside the time and turning up .. starting to make your meditation practice a daily habit.